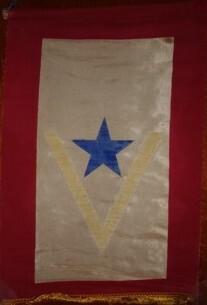 The "Sons in Service" flag was used during World War I and World War II. Each family was entitled to hang a small Son In Service flag in their window, the blue star in the center of the red-bordered white rectangle signified a family member in active service. The star was replaced (or covered) with a gold star (in practice, yellow or dark yellow) if the family member died in action. (Hence the name of the organization "Gold Star Mothers" of women who had lost sons in the war.) There were other variations to the star for missing in action, injured, captured, etc, etc, but flags of that sort are rarely, if ever, seen. Sons in Service flags made and used by families usually were no larger than about one foot long. They were always hung vertically, a stick being sewn into the top heading of the flag and a piece of string attached to both ends of the stick - the string suspended at its midpoint from a hook or some other feature of a front window of the home. If a family had a husband and a son, or multiple family members in the service of their country, then additional blue stars were set into the white rectangle. Organizations and corporations extended this practice to fly flags incorporating stars for each of their members/employees who were off to war and, of course, would change/overlay the blue stars with gold ones when the news came back that one of theirs had died in action. These larger flags (I have one with some 50 stars in a circle, a quarter of them in gold, measuring about 8 feet long overall) were sometimes flown outside on a pole, but most often were suspended from the ceiling of the factory / meeting hall indoors. It is not always easy to determine a date for these flags, though I believe that WW I era flags were more likely to be made of wool, and WW II flags usually were sewn of cotton bunting. However, they are definitely no older than 1917, the date of entry of the USA into WW I. Some WW II era flags with one or two stars were printed on silk and sold retail for those who didn't feel like sewing their own. "The State of Massachusetts, by resolution of its House of Representatives, May 28, 1918, established a new form of recognition of service under the U.S. Flag, based upon the practice that arose during the World War of displaying in the home office, club, or factory, a blue star (loyalty, sincerity, justice) upon a white field (hope, purity, truth) each star representing a member of the family or organization in service, by adding thereto certain emblems symbolizing events of service as indicated on opposite page." A Blue Star - "Service in Army or Navy." A Blue Star with a Gold Greek Cross in the Center - "Wounded in Service." A Blue Star with a Gold Ring superimposed - "Decorated for Distinguished Service." An inverted Blue Star with both the Gold Greek Cross and the Gold Ring (as in (2) and (3)) - "Missing." An inverted Blue Star inside of a Red Ring - "Captured." An inverted Blue Star superimposed over a Red Pentagon - "Wounded and Decorated for Distinguished Service." A Gold Star bordered Blue with a Gold Ring superimposed on it - "Decorated for Distinguished Service," also seems to indicate the serviceman died, but that is not stated. A Blue Star superimposed over a Red Pentagon with a Gold Greek Cross in the Center and a Gold Ring Superimposed on it - "Wounded, Decorated for Distinguished Service and Missing." A Gold Star bordered Blue with a Laurel Wreath superimposed on it - "Died in Service. Laurel Wreath Optional." "Gold represents wounds, distinguished service and death. Red, represents missing or captured. If desired, rank may be shown by the proper insignia of Officer or non-Commissioned Officer placed directly above the star. Service in the 'Zone of Advance' and foreign service may be symbolized by a gold chevron placed below the star, one shown for each six months of such service." Notice there is no mention of the red border of the flag, as used in practice. This appears to be a service star flag for "Service in the 'Zone of Advance' and foreign service may be symbolized by a gold chevron placed below the star, one shown for each six months of such service." I have just stumbled across a site which seems to indicate a couple more symbols being used - red crosses for nurses and chaplains crosses for chaplains. Whether this usage was official or unofficial I know not. "Pastor Bloom served the church during World War 1, and also acted as chaplain of the Eight Infantry Regiment of the Texas National Guard. The church's service flag has forty-six blue stars representing those in the various military branches, plus two red crosses for nurses and Chaplain's cross for Pastor Bloom. Three of the blue stars were replaced by gold ones for the three sons of the church who died in the war." "CPT Robert Queissner of the 5th Ohio Infantry is credited with starting the service flag tradition. He made a small flag to display in his home to honor his two sons who fought on the front lines in Europe in World War I. The flag was white with a red border and included two blue stars in the middle, one representing each son." Although not the first design submitted to the US Patent Office for a Service Flag (nor the last), the two patents, numbers D0051463 and D051464 were the first Service Flag Designs patented on November 6, 1917. The two designs were by, and patents granted to, Robert L. Queisser of East Cleveland, Ohio. The first, D051463, was for a Service Flag design watch fob or "other articles of adornment, as stick pins, buttons, or brooches" and it shows four stars in a staggered pattern. The other patent, D051464, was for a flag with two stars. The illustrations here follow the Patent Docs (flag design only, no watch fob strap or flag pole). The authorization for the flag is still on the books as 36 USC 176 and the instructions for design and display in the Department of Defense awards manual, DoD 1348.33-M.
C10.3.4.1.2.1. Instead of using a separate star for each Service member, one star may be used with the number of Service members indicated by Arabic numerals, which shall appear below the star. C10.3.4.1.2.2. If any Service members are deceased, as determined under the circumstances cited in paragraph C10.3.4.1.1.4., above, a gold star shall be placed nearest the staff, or above the blue star in the case of a flag used in a vertical display (Figure C10.F1.). Below that star shall be the Arabic numerals. C10.3.4.1.2.3. The gold stars in both cases shall be smaller than the blue stars so that the blue shall form a border. The numerals in all cases shall be in blue. The term "service flag" can apply to all the military and civilian service flags. That is blindingly obvious. But by act of Congress (Title 36, United States Code, Section 901), the flag to be displayed by members of the immediate family of persons in military service during time of hostilities is Legally, Officially designated as the "Service Flag." DoD 1348.33-M authorizes the Secretary of Defense to approve the design of the flag and prescribe regulations governing its manufacture and use. It also refers to this flag as "The Service Flag." The fact that some organizations and flag companies call it "The Blue Star Banner" is neither here nor there. The flag is an official symbol authorized by Congress. There's nothing wrong with calling it the Blue Star Banner, of course, and there is indeed a long tradition of referring to it by that nickname. But a nickname is all it is--like Stars and Stripes or Old Glory for the national flag. It is not the official name of this flag. Individuals Entitled To Display Service Flag. - A service flag approved by the Secretary of Defense may be displayed in a window of the place of residence of individuals who are members of the immediate family of an individual serving in the Armed Forces of the United States during any period of war or hostilities in which the Armed Forces of the United States are engaged. Individuals Entitled To Display Service Lapel Button. - A service lapel button approved by the Secretary may be worn by members of the immediate family of an individual serving in the Armed Forces of the United States during any period of war or hostilities in which the Armed Forces of the United States are engaged. License To Manufacture and Sell Service Flags and Service Lapel Buttons. - Any person may apply to the Secretary for a license to manufacture and sell the approved service flag, or the approved service lapel button, or both. Any person that manufactures a service flag or service lapel button without having first obtained a license, or otherwise violates this section is liable to the United States Government for a civil penalty of not more than $1,000. Regulations. - The Secretary may prescribe regulations necessary to carry out this section. Referring to the In Service flags as Son In Service flags is a common mistake. The emblem as patented was called an In Service emblem as it would allow for the display by someone who had a father, husband, son, mother, sister and daughter who were in the military. The gold star represented anyone who died, male or female, in the military by any cause including disease and accident, not just "in action." The information regarding the gold star came from an original order form dated in early 1948. It's official name is Gold Star Lapel Button. There still exist a number of the blue star pins on their original card of issue and all the ones I've owned or have seen had been labeled "In Service Emblem." They probably picked up the "Son" because most persons in the military are men. There are patent files in the state library and next time I go up there I'll look it up and get a copy of the information. The patent was issued on November 6, 1917 but I don't have the number. Blue Star Mothers of America, Inc was founded in Flint, Michigan in 1942 and became a U.S. Congress chartered corporation in 1960. Their website www.bluestarmothers.org/ states the origin of their flag: "The Service flag, also called the Blue Star Flag, was designed and patented by WWI Army Captain Robert L. Queisser of the 5th Ohio Infantry who had two sons serving on the front line." . I spotted a flag (twice) here in my hometown in Ohio. It was being flown beneath the American flag. The flag has a white field. A horizontal service star is on the centre of the flag. The blue text "We Honor Those Who Serve" surrounds the service star. Apparently, the American Legion is distributing this flag. It originated as a yard sign; now it is a full size flag. The term "Service Flag" includes both traditional flags that fly from poles and window banners that hang down from a crossbar. In practice some of these "Service Flags" were made of paper or cardboard as well as cloth. The IDEA of the flag was originated by Captain (later Colonel) James Garfield McIlroy in April or May, 1917, in Cleveland, Ohio, while he was briefly stationed there as a recruiting officer. He claimed he based the concept on a Japanese tradition which is true (but I am not describing that here). He introduced a design that was later used in essence as the War Bond Honor Flag. His design was also used to a small degree by the US Army in its recruiting. McIlroy's idea inspired a number of others to come up with their own designs. No less than six different designs were proposed and/or manufactured by other people from Cleveland. The concept spread fast and some 40 or more designs for Service Flags were submitted to the US Patent Office before the end of the War. Interestingly some of the earliest applications were not granted until a number of years after the war was over. One of the first designs to be submitted to the Patent office is clearly modeled after the Japanese designs in use since at least 1905. Designed by William H. Boorman, it was submitted more than a month before the design that ultimately saw the most usage and showed a blue rectangle in the center bearing a white star with red rays on white surrounding the center panel very much like the Japanese Ensign. One of the Clevelanders who patented designs was Captain Robert L. Queisser. Patent # D051463 was for use on a watch fob and showed 4 staggered blue stars on a red-bordered white field and patent D051464 was a flag of the same design showing two blue stars (he had two sons in the service shortly after the US entered the war). Although he claimed to have had the concept before McIlroy, there is no evidence that this was true other than his claim. His patent was granted in one of the shortest times of any design patent that I have seen, just over one month, receiving them 6 November 1917. By contrast one application for a Service Flag design (and so named) made prior to his was not granted until 1923, after the war. Queisser's design with some modifications rapidly became popular and spread quickly across the country. He took steps to collect his royalties on these flags (10%) and was forced by popular opinion to donate half of those funds to the Red Cross, which he insisted he intended to do all along. Advertisements of the day show 1, 3, and more star service flags being made commercially, with additional stars supplied free so you could fashion your own 2 and 4 star versions. That way the manufacturing company would technically not be violating the patents Queisser held. The US Government promoted the Service Flag, although there was considerable public sentiment to utilize some other design that wasn't providing income to one person or to encourage Queisser to donate his patent to the government (which he did not do). This sentiment went as far as resolutions introduced in Congress and some states, most notably Massachusetts, officially approved alternate designs. Variations of the original design included the addition of silver stars for wounded soldiers and gold stars for those who died in service. The concept of a Service Flag was used in many different ways including the Red Cross, the Bond and War Savings Stamps programs, the US School Garden Army and others. After the War, service flags of a different design were approved by the US Government that indicated commercial establishments had rehired veterans. Variants of the design were introduced in Canada and Australia, with some success (and other variants) in Canada. After Queisser's patents expired, the design was resurrected and used extensively with many variations during World War II. Ultimately the US Government took control of the design and issued specifications for its use. The design was used during the Korean War and in a limited way during the Vietnam War. It has been revived and is seen quite frequently today. This design predates the Queisser design but probably not the McIlroy designs. It is directly based on the Japanese custom. These are the two patent designs by Robert L. Queisser. #1 is from his patent for a Watch Fob #D051463; #2 is his patent for a Service Flag #D051464. The official Massachusetts Service Banner. This is a copy of the actual banner that was displayed on the Massachusetts State House during the war. The American Red Cross Service Flag. This flag represented one member of the Red Cross. Additional members were entitled to add a smaller cross placed in the corners of the flag. An unofficial design representing women who married soldiers off to the front, flown subordinate to the Service Flag. An official US Dept. of Labor design representing veterans rehired after the war. The red stars were placed in number of the actual number of men rehired or a large red star with a white numeral on it could be used. The official US Dept. of Agriculture Service Flag for the School Garden Army, which promoted vegetable gardening by school children. There was also a "Home Canning Service Flag". The official Canadian Service Flag. More Maple Leaves were to be added for additional service men; if any were killed in service, the leaf would be replaced by a red leaf (although in some accounts, gold leaves were also used).